Katie Sollohub has a background in Social Anthropology from Sussex University and Fine Art from Northbrook College but says her training is less art school and more from persistence in the field, and experience. Alongside her practice as an artist, her regular residencies at some of Britain’s finest old houses, Katie teaches painting, using her own experiences and processes to motivate others. Her work has been selected for the RA Summer Show, the Lynne Painter Stainers Prize in 2014 and 2016, the Jerwood Drawing Prize, and The Discerning Eye in 2015. Her paintings explore the narrative components of everyday objects, memories, interior and exterior spaces, brought to life with her spectacular use of colour and detail. Her expressive drawings demonstrate her love of looking. 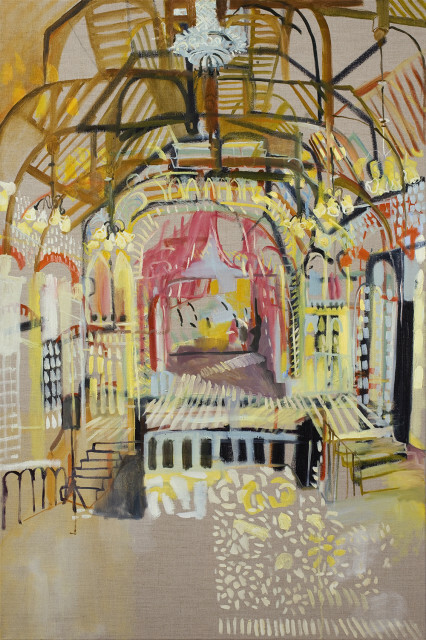 Her latest body of work is a series of paintings and drawings inspired by her year long residency at Sandycombe Lodge, the house of JMW Turner, in Twickenham. She spent one day (or night) a week, exploring the house through the mediums of charcoal and oil paint. She began by taking stock of the house exterior, and then moved to the iconic hallway (designed in partnership with famous architect Sir John Soane), along with bright, colourful scenes of the rest of the interior.